Recently, I ran more than 100,000 words through Google's Keyword tool, showing results for search volume, clicks, etc. One of the things that popped out was that "amazon" was near the top. This was strange to me, but I realized that a lot of people must just start their search on Amazon by typing in the Google search bar. 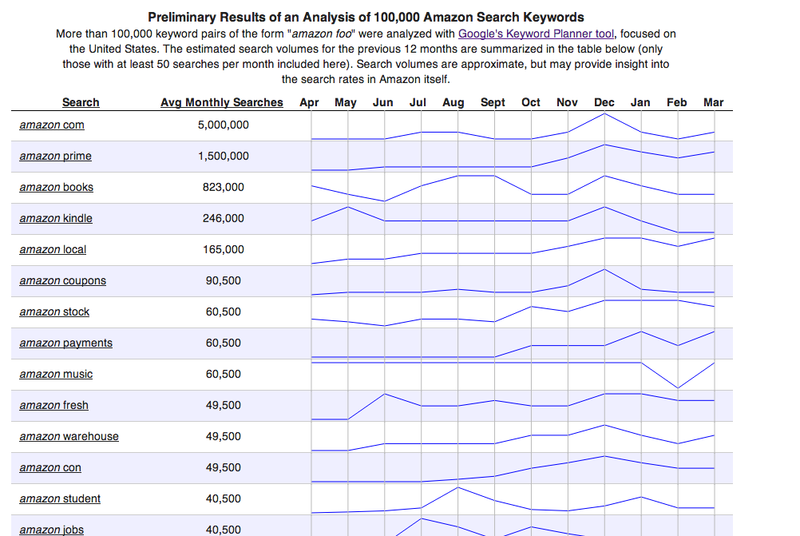 This got me interested in doing a follow-on analysis, where I used bigrams that started with "amazon", using the same 100,000 words as used in the first little study. Despite the dictionary itself being from about 1991, I thought that this might reveal some interesting monthly patterns as to what people might be searching for on Amazon, as well as perhaps reveal some potential niche sites (or starting places for them). I am unsure of the the degree of reliability and quantity of the numbers from the Google's tool, but some of them seem to make sense. No matter what, this is fascinating to me. There are still a few things I'd like to make easy to do - for one, group products based on where the peaks seem to be (independent of raw numbers). And this tiny sample, while interesting, really makes you think and be in awe of the magnitude and depth of data that search providers like Amazon, Google, and Facebook have.